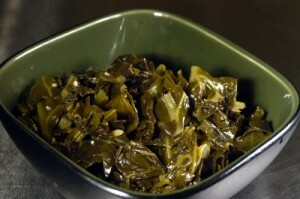 Collard greens are a Southern institution and cherished way of life. But you don’t have to be from the South, or live there, to cook up a mean pot of collards. Here’s an easy, step-by-step guide on how to cook collard greens. To make the magic happen, put your olive oil on first. Let it get nice and hot before you start adding to it. Put in the garlic and let it warm until gets to a tan, slightly brown color. Next, add in the chicken stock and turkey leg. Let everything cook for 25 to 30 minutes. Reset your timer for 45 minutes, but this time add in the collards. Keep checking it though, to make sure the water from the chicken stock doesn’t boil out completely. Add more water as needed. After that, add in the rest of your ingredients and leave it on the stove until it’s all gone a deep, dark green. Drain the water and enjoy!